Valuable urban art at Perth City Farm is in danger of being lost says a local art group whose protests have—temporarily at least—halted the destruction of an 18-year-old mural. City Farm had planned to allow a visiting European artist to paint over the work, as it was looking tired. Lady Bananas from Artists Anonymous Collective says that would be completely misreading the value of urban art. 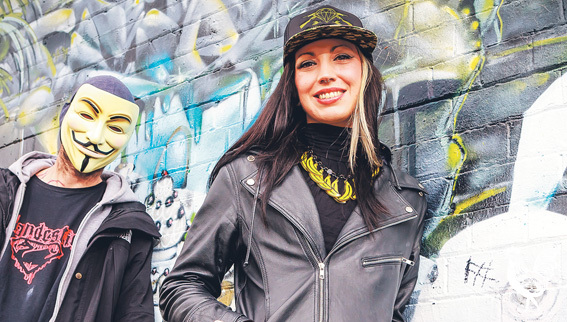 City Farm has been a spiritual home for Perth graffiti since 1995, when then-management invited artists who’d been illegally tagging the site to re-paint its barns and buildings. Many, including DASH and KID ZOOM, are now internationally renowned and have exhibited at the National Gallery of Victoria and other high-falutin’ places. Lady Bananas is pleased City Farm—wracked in recent weeks by its own management turmoil—has halted the paint-over but wants assurances of a more lasting solution. Cliff Morris, CEO of Men of the Trees, the organisation in charge of City Farm, says he recognises the significance of urban art and will ensure any future attempts to modify it come before the MOTT committee first. Lady Bananas notes a 2011 farm mural, Ironlak in Wonderland, has sentimental as well as artistic value. “Jarrad Hawkins (AXUP), who worked on that piece with the 3DB crew, sadly died in March,” she says. “It was the first, legal large-scale mural where the crew had the chance to really showcase to the rest of Australia what they did best. She notes a request from 3DB for it to repaint the mural if the farm ever decided it required refreshing, was rejected. She is lobbying Perth city council to protect all historic graffiti across the city. While I agree that urban art has a huge cultural and artistic value, the thing that sets it apart and makes it such a vibrant, living form is its ability to evolve, remix and, yes, repaint over itself in a continuous cycle of renewal. By all means document and capture these great pieces, but never allow yourself to get precious and disrespect the anarchic roots of urban art – the true value and power of street art lies in its ability to destroy and renew itself every single day. Street art will never die but it will stagnate if we insist on putting a golden frame around it and rope it off like some dusty museum piece.